M3AAWG, ESPC, APWG, EEC, DMA, OTA, OI, EIS, IAPP, Sherpa — Acronyms got you down? Are you starting to strain your eyes as if you’re at an optometrist’s office being fitted for a new pair of glasses? Fear not, in this post we’ll break down the various organizations and what you need to know if you want to get involved in the industry as a whole. Part of my job at SparkPost is to work with these email industry organizations and ensure that we stay abreast of changes in policy, industry accepted best practices and contribute to the work of keeping the internet a safer place. If you’ve ever wanted to give back, or learn more about the various corners of the messaging industry let this serve as your cheat sheet. M3AAWG (Messaging Malware Mobile Anti-Abuse Working Group) is probably the best known anti-abuse collective out there. M3AAWG started as coalition of ISP postmasters, anti-abuse experts and other concerned parties and has evolved to include policy experts, law enforcement, researchers and senders committed to curbing abuse messaging abuse in all of its various forms. The 3 in M3AAWG refers to the three verticals that the organization focuses on as part of their ongoing mission to make the inbox, the mobile phone and Internet overall a safer place for everyone. Discussions at M3AAWG meetings run the gamut from very technical to policy driven and legal sounding in nature. Organizations and attendees need to apply for membership and be accepted by the board before attending a meeting. Guest passes are given out on a case by case basis, but an application is still required. APWG (Anti-Phishing Working Group) The APWG, as their title implies, focuses on phishing and other forms of cyber crime, not just messaging abuse. They work with policy makers, governments and other organizations including businesses to educate & hone the response to an incident of cyber crime. Data breaches have been in the news quite a bit lately and many of these breaches have started as phishing or spear phishing attacks targeting executives and key personnel at a company. As an organization you have to understand the nature of these attacks and what to do if you detect a data breach. OTA (Online Trust Alliance) focuses on advancing policies and initiatives to protect user rights, privacy and data. They have a specific focus on the growing ‘Internet of Things’ which could explode the amount and types of data exploitable by hackers. IAPP (International Association of Privacy Professionals) is an information data management body that runs certification programs for data privacy. If you or your company are concerned about how to protect your data, what the laws are that govern the storage, transmission or processing of data, then you should become a member of this organization or familiarize yourself with their resources. DMA (Direct Marketing Association of America) is the largest direct marketing association in the United States. They are a place that advances the agenda of marketers through advocacy and congressional lobbies. The DMA hosts numerous events each year and also has an annual conference known as &Then which brings together organizations from every corner of the marketing universe. EEC (Email Experience Council) is sometimes referred to as the digital arm of the DMA. The EEC is focused on email and all things digital, from data, to social, mobile etc. are ripe topics of discussion at the annual Email Evolution Conference. The EEC is owned by the DMA but operates fairly independent of the DMA and promotes their own agenda. Marketers flock to the annual event to hear luminaries from across the industry present on the latest approaches to email marketing, data driven marketing techniques, emerging channels and more. The EEC has taken on work to publish best practice guides like the Global Compliance Guide that documents the nuances and differences between data laws around the globe. EIS (Email Insider Summits) This is less of an organization and more of a bi-annual conference put on by the media outlet MediaPost. MediaPost’s content is part of the overall knowledge share of the email marketing world and good to take stock of. The event brings together senior marketers for 3 days of talks and networking in exotic locales. Consequently, email isn’t the only thing MediaPost hosts as an event, they have expanded into TV insider summits, Publishing insider summits, Search Summits etc. As a hub for thought leadership they have expanded their events to include other distinct Martech verticals and technologies. OI (Only Influencers) started as an “invite only” list of email experts and thought leaders and has since evolved into a blog, community, and earlier this year, first ever conference. This, like EIS, is a networking-centric event. Marketing Sherpa (MecLabs) This is also more or less an annual event hosted by Meclabs and focuses on everything from email copywriting to testing and content optimization. Like the 2 aforementioned bodies/events, this one tends to be more networking focused. PS. 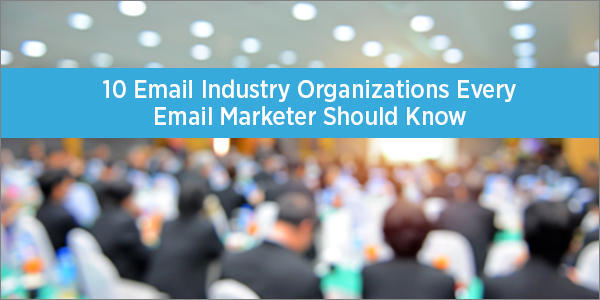 Are there email industry organizations that you think we missed? Comment below and we’ll take a look.